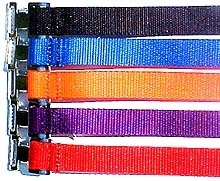 A strong 1" wide nylon strap with a very strong durable alligator clip attached to use around gate panels, secure buckets, hang buckets . . . the uses are almost endless! Available in 18", 24" or 36".